(P1) A biodegradable film made of milk protein has been invented, according to the U.S. Department of Agriculture (USDA) on Aug. 21. (P2) The film is a mixture of a milk protein called casein and citrus pectin. Pectin is a substance that turns fruits into jams and jellies. (P3) The film looks like a normal plastic wrap. But it is less sticky and even edible. (P4) “The purpose was to make a packaging that had zero waste,” Bonnaillie, a research chemical engineer with the USDA, told CBC News. (P5) The film is safer, stronger and much more resistant to moisture than a plastic wrap. (P6) A small company in Texas plans to sell the new film within the next three years. (P7) But there are drawbacks on the new product as some question whether the product is necessary. 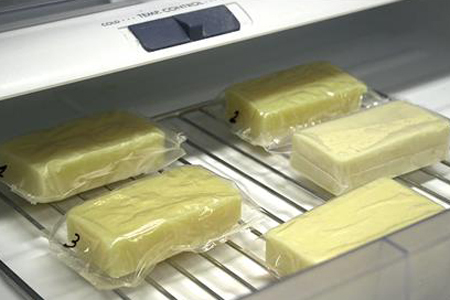 (P8) “I doubt whether it is ethical to use milk to make food wrap while there are more than two billion people around the world that are starving,” says Lee Deok-hwan, a Professor in Sogang University’s Department of Chemistry. Do you think it’s unethical to sell this new biodegradable milk protein film because people are starving around the world? Why or why not? Would you buy this new biodegradable film? Why or why not? Do you think there should be more zero waste products invented? Why or why not? The biodegradable film has 2 ingredients. What are they? Where’s the company that will market the new product located? How many people worldwide suffer from extreme hunger?